It’s game day for Julie Griffin ’94. And on game day, there are 89 luxury suites to prepare. Eighty-nine food packages to coordinate. Special requests to fill. Field tours to lead. Griffin knows all too well what is in store for her: certainly stress, but also an indescribable excitement that can only come from working for the five-time Super Bowl champion New England Patriots. As the luxury suite manager for Gillette Stadium in Foxboro, Massachusetts, Griffin is the go-to contact for anything suite holders need on game day. A chocolate raspberry cake to celebrate a daughter’s birthday at the game? No problem. More Diet Pepsi than regular Pepsi? Absolutely. And the job goes beyond just game days. It’s a year-round business. Tickets to Kenny Chesney? Sure thing. A trip to the Broncos game? Let’s plan that for you. There are certainly challenges for her in the job itself. A lot of responsibility, a large waitstaff and service team to quarterback through the day, and a lot of relationships with suite holders to manage and keep happy. But in the challenges come some of the biggest successes. On a typical game day, Griffin walks more than 20 miles and wears three sets of shoes—first sneakers, then heels, then slippers—a challenge that reflects her journey to Foxboro: long and winding, with different sets of shoes and several miles logged. Preparation, she says, came from Regis. Though the exercise seemed simple, that confidence has remained throughout her career—and helped her create opportunities. When Griffin wanted to get into restaurant management, for example, the Back Bay Restaurant Group (BBRG) in Boston wouldn’t hire her because she lacked experience. Instead of giving up, she forged ahead, taking a management position with Carla’s Restaurant in Norwood, Massachusetts. After a few years there, BBRG hired her. Eventually, Griffin was presented with the opportunity to work for a brand-new online shopping and grocery delivery service named Peapod. Once again, she was confident enough to take a risk and wear different shoes for a different job. Ultimately, Griffin led the opening of six warehouse locations in Stop & Shop supermarkets throughout Massachusetts. Peapod is now one of the largest online delivery services in the country. 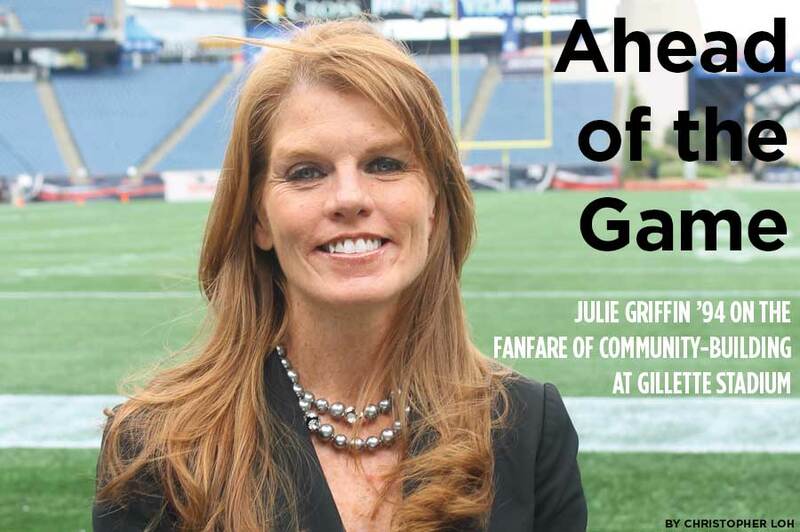 When Gillette opened in 2002, Griffin interviewed for a staffing coordinator position. She simply thought it was a good opportunity and took a chance but didn’t land the job. As luck would have it, another position in the food and beverage department opened and she jumped on it. She was hired and a few years later, in June 2007, she transferred to marketing to run the luxury suites. Since joining the Patriots, Griffin has been a part of six Super Bowl runs, four Super Bowl wins, and has never seen a losing season. But for Griffin there’s more to it than that. A winning product on the field is of course crucial to keeping suite holders happy, but it’s also her relationships with them that keep her happy in her job. “Being confident to take risks, being confident to build and maintain these relationships—that is what Regis gave to me. It’s paramount to my career,” Griffin explains. Above all, her job has provided her the ability to give back and serve others, something instilled in her from her days walking the halls at Regis. Also paramount is continuing the sense of community that Regis provided to her.